Lydia Rees (ARAS staff) at Walker Shelter in Bella Vista. 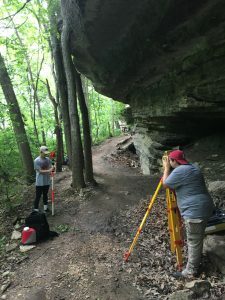 The Arkansas Archeological Survey (ARAS) staff respond to several bluff shelter looting incidents every year. This year, the most extensive was our salvage work at Walker Shelter in Bella Vista. 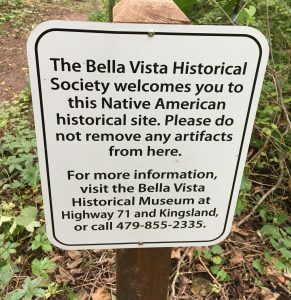 The Bella Vista Historical Museum contacted the ARAS-UAF Research Station regarding preventing further looting at an impressive shelter along the Bella Vista Back 40 trail system. This trail had been the target of much looting activity prior to the trail opening in the fall of 2016, and it was the Museum’s hope that we could assist with documenting the damage and helping to deter subsequent looting. 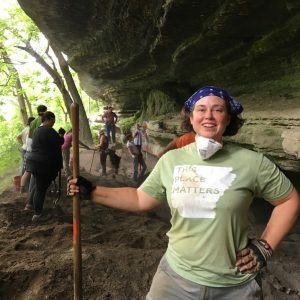 This June, as a side-project of the 2017 University of Arkansas archeological field school, 10 students and several members of the ARAS staff visited Walker Shelter. We created a detailed site map, documented the looting and conducted salvage excavations along the looted areas. At least a meter and a half of archeological deposits were documented―including the recovery of a Middle Archaic Calf Creek projectile point. The looters pits were backfilled and the Museum has plans for further sterile fill and signage at the site…we are also planning a guided hike to the shelter and a lecture about the importance of bluff shelters as an endangered resources in the fall–stay tuned. 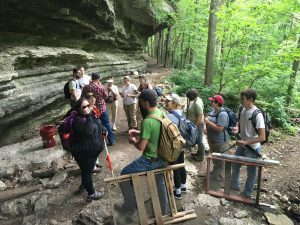 The 2017 University of Arkansas archeological field school arrives at Walker Shelter in Bella Vista after a brisk hike in. 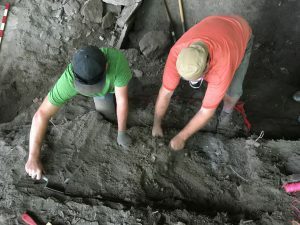 Kayden Dennis (UofA Anthropology undergraduate) and Jared Pebworth (ARAS) documenting looter disturbance and identifying intact deposits at Walker Shelter. Victoria Jones (UofA graduate student) and Jamie Middleton (UofA Honors undergraduate) mapping Walker Shelter. 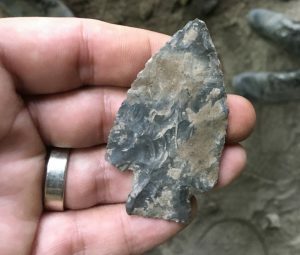 Late Archaic projectile point recovered from the base of the looter disturbance at Walker Shelter. Signage placed at Walker Shelter in order to help deter looting.